1310 Roman. Augustus and Agrippa brass dupondius, reverse crocodile chained to palm. 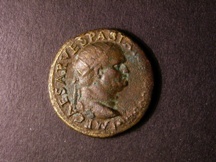 Nemausus mint after 10 BC. GF/VF. 634 Roman (36) Brass sesterti, dupondi and asses. 1st - 3rd century A.D. Includes Nero, Claudius and Nerva. Fair to about very fine.